Hyco International is a world leader in the supply of hydraulic cylinders for the mobile equipment market. With 6 manufacturing facilities on three continents and a dedicated and highly motivated team of employees, Hyco makes the industry's most complete range of cost competitive hydraulic cylinders. The engineers had a specific preheating application that was required for their hydraulic telescopic and rod cylinders. The casings needed to be preheated to a temperature of 600F within a period of 2 hours before they moved on to the assembly phase. The items to be preheated would rest inside the oven upright to ensure even, quick preheating. The customer wanted the oven to be top-loading and forced-convection. 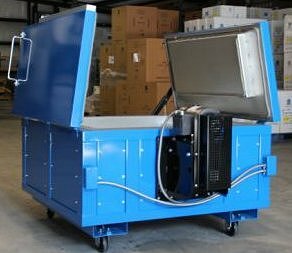 For this particular application we designed a custom industrial preheating oven from scratch and called it the K-TL-FC6. 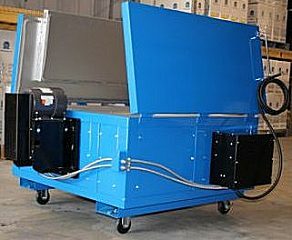 It had to be top-loading, and because of the size of the unit, we designed unique, split top-loading doors with heavy duty handles to allow for the easy loading and unloading of the parts. A 1HP blower was installed at the back of the oven for forced convection, allowing the parts to be heated quickly in the time frame required. The preheat oven is insulated all around, including the doors to ensure containment of heat and rapid preheating of the cylinder casings. 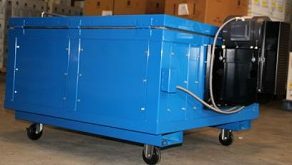 The K-TL-FC6 preheating oven rests on lockable casters to enable free movement of the oven around the workplace and to different workstations. 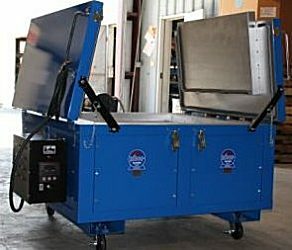 This custom oven is useful for a variety of purposes, not just for cylinder casings. The temperature range can be modified for any application. A miniature programmable digital controller was installed for this oven so the temperature reading would remain very accurate. The K-TL-FC6 heat treating oven is constructed of carbon steel throughout. The oven exterior has a highly durable, powder-coat finish in blue that is resistant to scratching and corrosion. 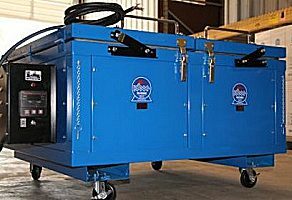 This a top-loading, floor-positioned preheating oven and is designed to be stored on a floor for ease of access to the parts being preheated. The 1HP blower is installed at the back of the oven and is protected by a steel cover. 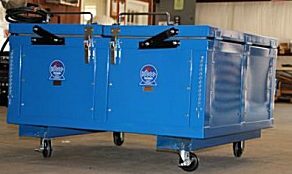 Lockable casters underneath the oven allow for easy transport to various workstation areas. The door hinges are tack-welded to ensure smooth operation for many years. The control panel which houses the digital PID is mounted on the side of the oven with heavy-duty rivets. A standard "ON/OFF" indicating light was also provided, which is bright enough to be seen from a distance. A variety of temperature control methods are available at preheatovens.com. The interior of the K-TL-FC6 preheat oven is fairly simple. No shelves were needed, but various shelving styles are available at preheatovens.com suitable for almost any custom preheating application. The elements are installed in the the sides of the oven which allows the heat to radiate inwards and around the oven. The interior of the K-TL-FC6 preheating oven is painted with a reflective, galvanized paint and the interior welds are touched up with high-temperature aluminum paint.